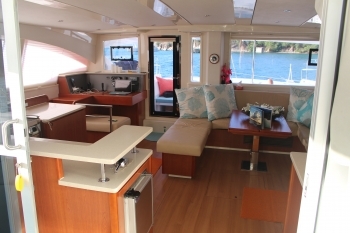 BLOSSOM sleeps up to 4 guests in 2 private, air conditioned guest cabins, 1 the full length of the starboard hull with Queen berth and sitting room, the other aft to port with Queen berth; both have private ensuite bathroom with stall shower, electric heads, TV, CD, and DVD players. The crew of 2 sleep forward to port and have their own bathroom. 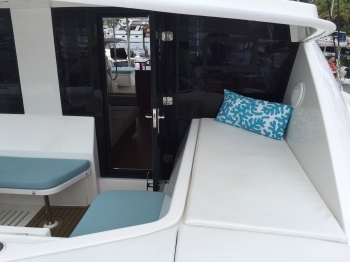 Available year round from St. Thomas, the 48′ Leopard catamaran, BLOSSOM, is a great yacht for one to two couples or families of three, in that she has a master suite that takes up the entire length of the starboard pontoon and a guest Queen cabin aft to port. Each has its own private bathroom. The crew sleep forward to port. 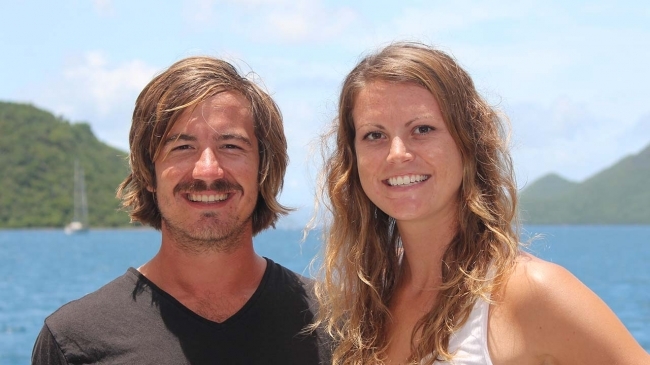 They are a young British American crew of two in their late 20s who love travelling and water sports and kite surfing. Molly McKernan lived in Hawaii for a while and Bryon Tippet the captain has his yacht masters ticket. 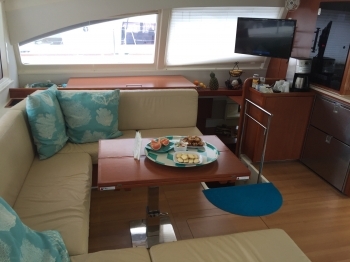 Built in 2013, BLOSSOM hails from South Africa and has a large dining table in the cockpit as well as two sunbathing mattresses outboard of the settees there… There is a small fly bridge with bench seating, used for sailing BLOSSOM mainly, but guests can get good views of the cruising ground there and enjoy the stars at night…. 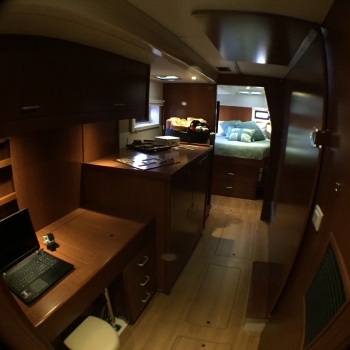 BLOSSOM is fully air conditioned throughout, and the guest cabins have 32 inch televisions and memory foam mattresses. 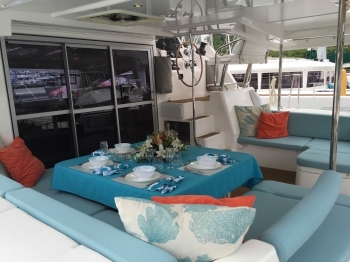 BLOSSOM won the 2015 Save the Blue Award (Tortola boat show), and she was the 2015 Runner up for BEST Yacht under 57ft (Tortola boat show) as well. 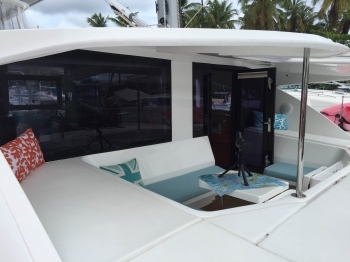 In 2014 she won the Save the Blue Award at the St Thomas boat show. 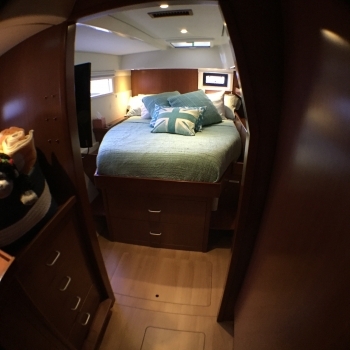 Byron and Molly strive to be the most environmentally friendly yacht in the Virgin Islands. 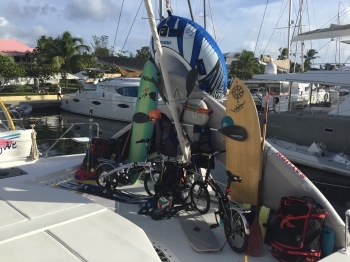 In addition to kite surfing gear, BLOSSOM also carries two folding bicycles and has a good amount of other sports gear. 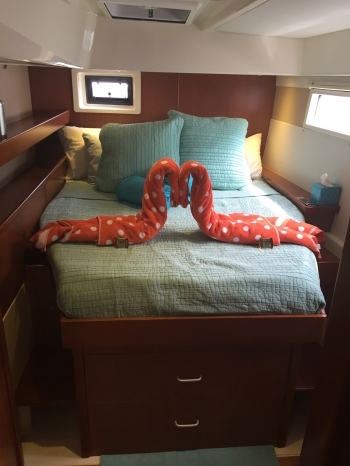 Blossom’s super crew of two will instantly help you feel relaxed and welcomed on your luxurious floating home. Byron and Molly will intrigue and entertain you with their great sense of humor, excellent hosting and passionate love for life as they take you on an adventure of a lifetime.